In my rambles about this neighbourhood, I collected the following Verses from the tombstones of different Churchyards. Some of the most whimsical, though nearly effaced, are still to be found in the cemetery of a considerable town on the high road from London to Bristol, and are probably the production of the same goose-quill; but whether wielded by the sexton, clerk, or even parson of the Parish, I could not learn: all I discovered upon the subject was, that some of them have been inscribed a good many years ago, apparently enough before the dawn of our present most wonderful poetical Æra. I remain, Mr. Editor, &c. &c.
But let me rise, and be myself again. Tread soft, good friends, least you should spring a mine! I was a workman in the powder line. Till Christ, he pleased to stop my gropings dark. To point my spirit, bolt upright, to heaven. For many Doctors did his case attend. Despond, avaunt—Faith makes the haven mine. Town with great credit more than 16 years. And frolicked on till laid in holy ground. No trust from her—God grant extent in aid. the device of a Serpent, with its tail in its mouth. If you know better, make a better mess. building. Thomas was aged 19—and Richard 21 years. A Sacred truth! now learn our awful fate! It crushed our vitals—people bawled out Shame! Never to work too fast, or drink too slow. Cheery, old soul, pack up, and come away. 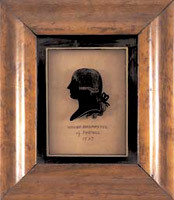 WILLIAM BECKFORD (1760–1884), excessively rich, was the inhabitant of Fonthill Abbey, one of the great monuments of the Gothic Revival. Both collector and writer, his novel Vathek, with the Episodes of Vathek was reissued in an exemplary edition of Broadbriar in 2001. His Biographical Memories of Extraordinary Painters remains one of literature’s greatest spoofs. 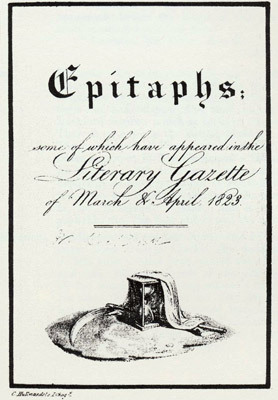 Epitaphs is perhaps the scarcest item in the Beckford canon; only three copies are known to exist.